Light heavyweight king Jon Jones defended his throne against Vitor Belfort in the featured contest. 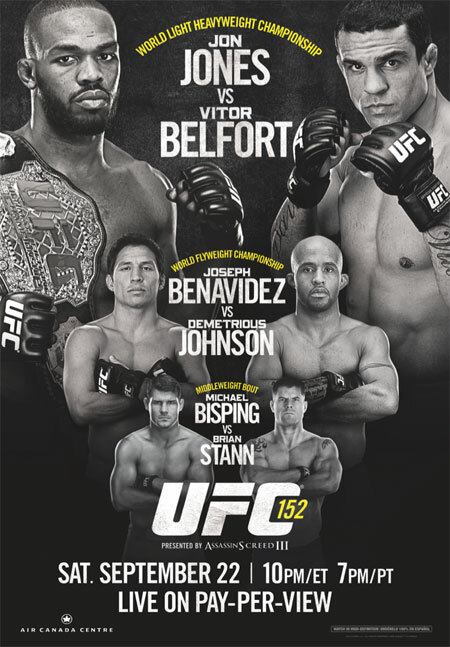 Demetrious Johnson beat Joseph Benavidez to become the promotion’s first flyweight champion in the co-main attraction. 1stRound: Gagnon floors him with a vicious left hand and pounces. He immediately takes his back and slaps on a rear-naked choke. Gagnon adjusts his grip for better leverage and Watson is forced to cry uncle. 1stRound: Solid back-and-forth action to start things off, nothing devastating landing for either welterweight. Thoresen doing a solid job of using his reach advantage to keep Baczynski at bay. Thoresen takes an accidental poke to the eye and time is called. Game on. Baczynski clobbers him with a left hook and Thoresen drops like a sack of potatoes. It’s a wrap. 1stRound: Brimage floored him momentarily with a straight right. Hettes dives for a takedown to no avail. Brimage takes his legs out with a kick. Brimage drops him again and follows him to the mat, which is a mistake. He realizes it and allows Hettes back to his feet. Hettes wobbles him with a left hand. Brimage tags him again, but it appears he’s slowing down. Brimage is clearly winning the standup battle. Brimage, 10-9. 2ndRound: Hettes is a 4.5-to-1 odds-on favorite, if you were wondering. Brimage is locked and loaded, as he comes out firing. Hettes connects with a kick. Hettes finally gets the fight to the mat. He takes Brimage’s back, but the underdog scrambles free. Hettes tags him with a flying knee and takes him down again. He instantly takes his back and secures a body lock with half the round remaining. Brimage gets to his feet. Hettes, 10-9. 3rdRound: Brimage scores with two rights to start off the final stanza. Hettes eats a pair of left hands, but continues to march forward. Brimage avoids another takedown attempt. Hettes has hunted for most of the frame, but Brimage was doing most of the scoring. Brimage, 10-9, and likely took the tango, 29-28. 1stRound: Benoist tags him with a body kick. Pierson drops him with a left and continues his assault. Benoist seems to have recovered. Pierson catches a kick and attacks his grounded opponent. Benoist tires an armbar from off his back, now transitions to an omoplata. They are back to their feet. Pierson wobbles him with a left hand. Thrilling opening five. Pierson, 10-9. 2ndRound: Pierson comes out like a house on fire. Pierson gets a momentary takedown. Benoist eats a left hook and falls to the canvas for a split second. Benoist continues to forge ahead, despite losing the standup battle. Not much to write home about in that frame. Pierson, 10-9. 3rdRound: Benoist is gonna have to bring it if he wants to win, but no sense of urgency in the opening half of the round. Whoa, Benoist clobbers him with a nasty left and drops him with a right. He’s bringing the pain on the mat, but Pierson manages to weather the storm. Another minute and Benoist could have finished this fight. Benoist, 10-9, but likely lost the contest, 29-28. 1stRound: Grant is taking it to him early. Dunham answers with an uppercut. They are winging punches in the pocket, with each landing their fair share of shots. Grant clocks him with a right. Dunham acting like it didn’t hurt, which means it did. Grant scores on a short elbow in the clinch and a right-left combo as they separate. Dunham secures a takedown. Grant, 10-9. 2ndRound: The thrilling action continues. Grant lands a knee and cuts Dunham’s forehead open. Blood is pouring down his face. The lightweights continue to exchange leather in the pocket. Grant lands two consecutive knees to the dome. Dunham scores a takedown, though isn’t able to inflict much damage. Grant, 10-9. 3rdRound: The final stanza is similar to the first two, awesome. Dunham’s forehead gash is nasty. Grant continues to beat his opponent to the punch. Dunham’s takedown attempt gets stuffed. Dunham finally plants Grant on the mat. However, it might be too little too late. Grant, 10-9, and likely swept the cards, 30-27. 1stRound: Pokrajac clinches Magalhaes up against the cage, Magalhaes uses an overhook to score the takedown as he begins to ground and pound. Pokrajac is keeping the Brazilian in his guard until Magalhaes moves into side control and goes straight for an armbar. Pokrajac escapes and ends up on top this time. After a minute Pokrajac decides that he wants the bout to continue on the feet. 10-9 Magalhaes. 2ndRound: The fighters clinch in the center of the Octagon, Pokrajac takes down Magalhaes, but is immediately in danger. Magalhaes attempts a triangle with no luck and transitions into another armbar attempt and forces Pokrajac to tapout right away. 1stRound: Oliveira plants his opponent on his back within the first minute. Swanson gets to his feet and avoiding taking any significant damage. Swanson tags him with a violent body shot. He follows up with a vicious right hand to the dome. It took Oliveira a second, but he finally realized he was hurt and crumbled to the canvas. Game. Set. Match, Swanson. 1stRound: Not much action early. Hamill has yet to attempt one takedown through three minutes. The crowd starts to boo for the first time tonight. Hamill easily takes him down and is dropping bombs from behind. Hollett is doing a decent job of avoiding damage, but “The Hammer” is bringing the pain. Hollett gets to his feet just before the horn sounds. Hamill, 10-9. 2ndRound: Hollett is a tad careless with a knee to the midsection and gets planted on his back for his troubles. Hamill lands minimal ground-and-pound before Hollett gets back up. The crowd rains down boos again. After eight thrilling fights, seven of which resulted in upsets, this scrap is a snoozer. Hamill slams him to the canvas just before the bell blares. Hamill, 10-9. 3rdRound: Hamill immediately secures a takedown. He’s simply smothering the Octagon rookie. Hamill is active with his ground assault. Hollett gets to his feet, but is easily led back down within seconds. The crowd voicing their displeasure once again. They get stood up due to inactivity. No matter, as Hollett is staring up at the ceiling once again. Hamill, 10-9, and should run the table, 30-27. 1stRound: Bisping has him clinched against the fence. Stann tags him with a straight right hand, but Bisping counters with a jab. Bisping working hard for a double-leg takedown, though Stann fends him off. “The Count” scores with a short elbow in the clinch, but Stann answers with a one-two combo as they separate. Stann takes a kick to the groin and time is called. Game on. Bisping now accepts a shot to the nuts. Game on. Stann tags him with three straight leg kicks, so he doesn’t seem too worried about getting taken down. Stann clocks him with a big right hand. Bisping is dazed and confused, but survives the round. Close round. Stann, 10-9. 2ndRound: Bisping gets a body lock and finally manages to slam Stann to the mat. Stann easily sweeps and is now in top position. Bisping is able to sprawl out and hits his opponent a couple of times before getting to his feet. Bisping connects on a one-two combo. He immediately picks Stann up and slams him to the ground. The Brit attempts a kimura to no avail. Bisping, 10-9. 3rdRound: Bisping charges forward and easily puts Stann down again. However, Bisping can’t keep him there for long. Bisping shoots again, but can’t land the takedown. Bisping connects with a one-two-combo. Stann hasn’t done much since rocking Bisping in the opening stanza. Bisping gets one final takedown to cap off his evening. Bisping, 10-9, and likely rallied to win, 29-28. 1stRound: Yves Lavigne will ref the first flyweight championship affair in UFC history. Benavidez charges forward looking for a takedown. Johnson greets him with a knee to the midsection for his troubles. Johnson scores with a right hand. Benavidez has controlled the center of the Octagon and continues to shoot, but he can’t get Johnson down. “Mighty Mouse” connects with another knee to the body. Benavidez can’t seem to catch him. Johnson, 10-9. 2ndRound: Benavidez lands a leg kick and follows up with a punch to the grill. He tags him with two straight shots to the face. Johnson avoids another takedown. Benavidez misses on a kick and Johnson almost took him down for his mistake. Johnson eats a big right hand. Benavidez, 10-9. 3rdRound: Man, these dudes are fast. Johnson scores with a body kick. Surprisingly, slight boos echoing throughout the arena. Benavidez finally gets a takedown, but it was just for a split second. Johnson nails him with a left hook and opens up a cut over his opponent’s left eye. If this goes to the cards, which it might, the decision could be controversial. Johnson, 10-9. 4thRound: Benavidez drops him with a right hand and pounces. He slaps on a guillotine choke from top position. Johnson is doing a decent job of preventing Benavidez from locking his hands to secure the choke. Johnson reverses and goes for a knee bar to no avail. Benavidez is still on top. Johnson gets to his feet. He ducks under a punch and puts Benavidez on his back. Another close round to score. Benavidez, 10-9. 5thRound: The 125-pound crown is up from grabs. Who wants it? Johnson picks him up and slams him to the ground for a brief moment. Johnson gets a body lock and secures a takedown. Benavidez wiggles free. Johnson looks like he could go another five rounds, while Benavidez appears more winded. Not too much damage done by either fighter in the final frame. This will be close. Johnson, 10-9, and should capture the flyweight title, 48-47. 1stRound: “Big” John McCarthy is the third man inside the Octagon. Jones puts the Brazilian on his back in under a minute. Belfort slaps on an armbar from his back and almost got Jones to tap. “Bones” is back on top and cuts Belfort with an elbow above his right eye. Belfort is a bloody mess already. Jones is really targeting that eye. Jones, 10-9. 2ndRound: The doctor checks out Belfort’s eye between rounds. Game on. Jones just misses on a spinning elbow. Belfort forges ahead with several punches. Jones starting to throw multiple side kicks to Belfort’s lead knee. Belfort lands a knee to the midsection and then pulls guard for some reason. Not much damage inflicted by either fighter. Jones, 10-9. 3rdRound: Jones giving him a generous serving of kicks to start the round. The champ hasn’t thrown a right hand since the armbar. I wonder if it’s hurt. Jones drops him with a side kick to the body. He follows him to the mat, but allows “The Phenom” to get back to his feet. Belfort appears to have recovered. Jones gets him to canvas again, though his attack isn’t nearly as vicious as it was in the opening frame. Jones, 10-9. 4thRound: Belfort lands a head kick and follows up with a flurry. He then pulls Jones into his guard again. Jones makes him pay for it this time. He moves to side control, pins down Belfort’s left arm with his knee and slaps on an Americana. Belfort is forced to cry uncle.